Asking my children to do something about the mess in their rooms is pretty much a common ritual in our house. My wife and me find ourselves puzzled ever too often with the amount of stuff our children have managed to collect over the years and their unique approach toward dealing with it: leaving it where it was last used. Luckily, “where it was last used” is confined in most cases to their own rooms. So, the ritual start with a request, and then a protest, and then some nagging, and eventually (one day or one week later) they do us all the favor of realizing that cleaning up the mess will take them less effort than dealing with the infinite nagging. Eventually, their rooms look decent (read: you can actually see the floor or the desk). But to our unsurprising surprise, it takes less than a week for the exact same level of mess to reappear magically. Chances are you are familiar with the practice of writing goals. Writing your goals works both at a personal level and at the organizational level. It focuses you consciously and unconsciously on where you aim to be. And sooner or later it drives concrete actions oriented toward your target. Except you have to beware of what you wish for. 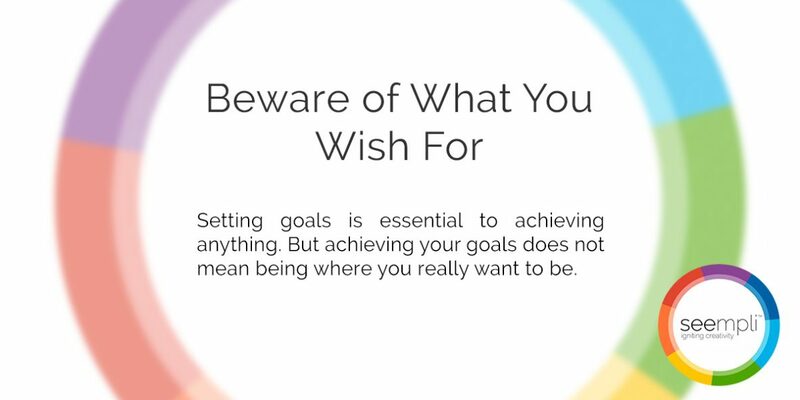 When defining goals while thinking of a concrete and focused bottom line, there’s always the risk of getting exactly what you wished for. Why is that a risk? Because reality is a bit more complex than that. When my wife and me are asking our children to do something about the mess in their rooms, they eventually do: they shove all their stuff to some drawers or their closet or under their beds. The mess is gone. The huge amount of stuff causing it isn’t. We are setting a concrete goal that doesn’t consider the root cause of the problem. So sooner or later we face it again. Besides not being effective, repeating this ritual over and over again is very frustrating — not just for us, but also to our kids who, from their perspective, did exactly what we asked them to do. Not addressing the root cause generates one type of boomerang goals which might do more harm than good. Let’s consider another one. In the first year after I launched seempli, I defined a goal to have a certain amount of subscribers by the end of the year. It appeared to be a reasonable goal at the time — I thought achieving it would be a step in the right direction. Makes sense, doesn’t it? So, by the end of the year, I almost reached my target. But the impact I had wished for it to have was far from being realized. I understood in retrospect that there’s a huge difference between users — even active users — and engaged users. And while this may sound trivial, it wasn’t for me. I realized that the ways to attract engaged users differ greatly from the methods you might use just to increase the number of users. My entire plan should have been different. This is a classic case of setting a goal which seems to be in the right direction, but failing to capture the real motivation — what we really aim for. One of the primary reasons this mistake so common is that the allegedly effective goal is easier to define, measure, and monitor. What could be easier to measure than the number of users? Active users is also pretty easy to track. But when it comes to defining and measuring engagement, well the story gets more complicated. So the easier definition is luring us, and since it appears to be in the right direction, we settle for it without giving it a second thought. But defining goals can get even more challenging than this. There are cases when a perfectly good goal — an otherwise effective goal focused on the real motivation or addressing the root cause of a problem you are facing — just happens to collide with a different goal. This can happen at a personal level, but it is more common in organizations (or any long term relationship between two or more people). And such a collision can easily turn into a conflict when two people or groups are each working toward their goals in isolation. Imagine your organization has a development group and a support group. The manager of the development group sets the following target: in the upcoming release we should ship 10% more Pro features than in the previous release without degradation to quality. This target by itself sounds not only reasonable but even balanced. It takes the quality aspect into account. At the same time, the Head of Support sets a target for her team to improve response time to customers’ issues by 10%. Again, a perfectly reasonable goal. These two goals can live side by side as long as each of them can be reached by each group alone. But let’s say after some analysis, the support team comes up with a killer idea for improving response time: improve the back-end logs of the product. Doing that is essential to reduce response time, but it requires some development effort in the upcoming release. At the same time, the development group has their own target to ship more Pro features, and back-end logging is not a feature you sell — the end user is not even aware of its existence. Enters a conflict. An alternative, consistent set of targets might be much more difficult to define, but it can be much more effective if you manage to do it: defining holistic targets which promote global optimization instead of local optimization. An example of such a target could be: improve customer loyalty by 10%. Each group can derive its own targets as long as they promote the global one. Conflict is still possible, but now we have a basis for resolving it: we just need to analyze which of the options has more impact on the global goal. Will the tenth new feature promote customer loyalty more, or will improving support response time by an additional 5% do the job? This might sound purely theoretical: do we even have the means to compare the two options in light of the global target? That’s a good question. Such an analysis can be far from being trivial. But in many cases, it is essential. Investing in this analysis (or even taking an educated guess based on experience and benchmarks) might help you do a quantum leap in organizational effectiveness, because eventually, everyone will are oriented to the same organizational goals instead of pulling toward different directions. Setting targets is essential. Writing your goals down and always keeping them in mind is a good practice. Planning how to achieve them is necessary. But to be effective you should base your goals on understanding the root cause of problems, on the motivation of opportunities, and on a holistic and aligned approach. When you think of it, all these prerequisites are essentially the same. The distinction between them can help us understand situations we face or common pitfalls. But at the end of day, all we have to do is make sure we really understand what it is we are trying to achieve.